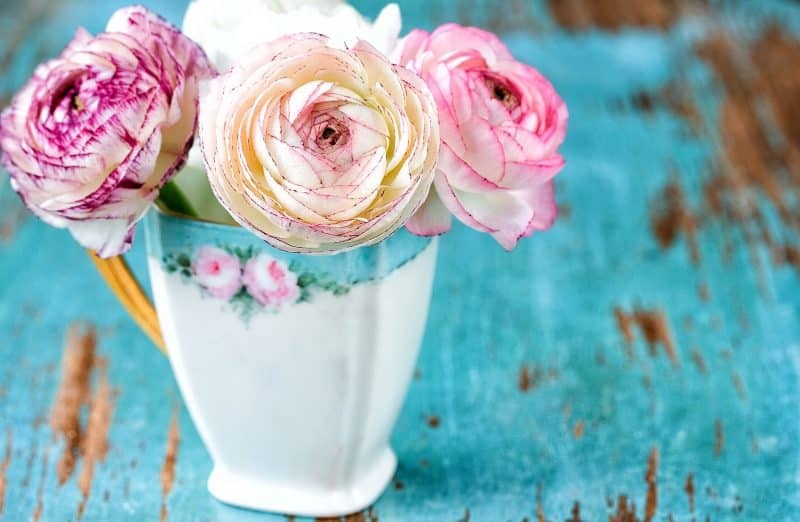 Spring is a great time to cut flowers — their color and scent can bring so much joy to our homes. Today, we are offering a home decoration idea to add a French country feel and a charming and rustic “je ne sais quoi” to your home. A champagne bucket received as a wedding gift can make a perfect vase for an anniversary bouquet. Glass water bottles are just right for a single flower with a long stem or just a couple flowers — especially those vintage glass bottles. At Art of the Home, we can’t have enough of them, simply love them! Vintage glass bottles come in many different shapes, designs, as well as colors. Mix and match to best fit the essence of your room and your mood of the moment – the process is quite enjoyable too. Most of mine are clear ones but I have also used amber colored vintage glass bottles to add a rustic look to a flower display. Glass vintage water bottles also make a very special gift when offered with flowers in it – a lovely alternative to a standard bouquet. A “Bonne Maman” preserves jar or other glass jars make cute small vases for tiny bouquet picked up by little ones. So tour your home for your next vase. Or next time you are at an antique boutique or a yard sale, consider objects not for what they were intended to be, but for what they could become in your home to create a welcoming and charming nest – so much fun!